I tried very hard to find people who had either visited Moscow in the last 4-5 years or made non-work trips here. Couldn´t find anyone in my close circle! This kept the mysterious touch to Moscow alive in my mind – I love its literature, its grandeur and Tolstoy – all generated from books I´ve read! 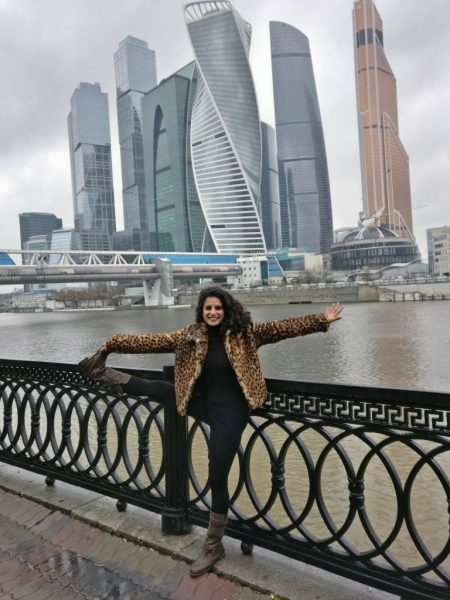 An off the beaten track for the Indian Tourists – Here´s my books coming to life in Moscow! It´s midnight and Moscow is freezing right now! I´ve had an unforgettable day! This is my Day 3. I walked for 7 hours flat and wascbeing a complete tourist. Usually I am never a good tourist. I ditch the museums, the art galleries etc, but not in Moscow. Here, my heart is naturally getting pulled to the grandeur of socialism at its best. It´s timeless. It´s new. It´s chaotic. It´s vast. It´s magnificent. It has a river flowing through it. In the night, the city shimmers. It has amazing idols. It´s reeking history every 50 metres. It’s freezing. Today I decided to mix yoga with the sights of Moscow´s best! My first stop of the day was the Moscow State University. The walking alleys outside it are dreamy, leafless trees that carry a certain romance! A lot of romance actually! From here we went to the Victory Park. Also my most favorite part is here – The World War II Museum. I am totally into WWII books and movies – and seeing this museum was overwhelming. Part of the Museum was a big hall where they had all the names of the WWII martyrs inscribed. So here my Respectful Tree pose Namaskars to Russia´s martyrs of WWII. The large stairs of the WWII Museum. As I mentioned it´s been drizzling in Moscow all day today. So i couldn’t do any of my sitting down poses. The indoors gave the liberty to put my knee down and stretch my tired quads. Btw – I did 100 Squats, 80 lunges and 10 Surya Namskars this morning! Working out during vacations is one of my favorite things – no pressures of getting things done in time. And finally, very reluctantly I agreed to visit the modern looking part of Moscow! I hope you enjoyed going through my experiences of Moscow with a touch of Yoga! I’ll send some more trivia, pics and Videos from Russia, very soon! I keep the Vodka, You can keep everything else 🙂 but Take your passion, places!